If you need to get your Dry Lining NVQ Level 2, there are a number of routes you can take, depending on your experience. We offer both On Site Assessment (we come to you) and One Day Practical Assessment (you come to us) so you choose the quickest, simplest and most convenient way to get your NVQ and CSCS Card. You can count on SuperSkills to give you Free, Impartial advice at all times. Don’t forget, you are welcome to call us on 01845 527 445 to find out more at any time! A most important point to start with – NVQ’s (the letters stand for National Vocational Qualification) involve your work being assessed in the workplace. You cannot get your NVQ by just attending a training programme and you cannot just start getting assessed in a workplace until you have built up some experience. See why knowing that is important. What are National Vocational Qualifications? NVQ’s are set at different levels. Level One is Foundation Level – this is where somebody would be if they had attended a basic City & Guilds course. They usually take ten to twenty days of training. Level Two is a “Skilled Trades” level. This is the qualification the vast majority of site workers have and the one that gets the CSCS “Skilled Worker” Blue Card. Level Three is a Supervisory level – somebody who has the skills to lead a team of trades on site and is able to undertake or oversee more complex work. They have a Gold “Supervisor” CSCS Card. Level Four and above are management level qualifications and holders of these have access to the CSCS Black Card. By On Site Assessment and Training. This route is open to people who have sufficient general site experience. It involves our Assessor visiting you in the workplace and seeing what level you are working at. He will judge your work and skills against the National Occupational Standards. 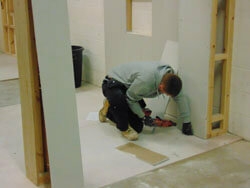 This will establish the “gap” between your skills and those required for the Interior Systems NVQ Level 2. He then agrees an Individual Learning Plan with you. He will continue to visit you, give you on-the-job training as required and undertake assessments of your work. At the same time, you will be building a file of evidence with photographs and any references you get from other trades. Once the evidence is there to show you are operating at the standard of a Skilled Worker, the assessments finish. Then you will be awarded your NVQ Certificate or Diploma (depending on your trade) in Interior Systems. By Experienced Worker Practical Assessment. To access this route, you must have at considerable general site experience. There are tens of thousands of excellent tradespeople who have been working capably for decades, but never got their qualifications. Yet they need to have their Interior Systems NVQ Level 2 to get a “Skilled Worker” CSCS Card. The Construction Industry Training Board recognised this and created a Fast Track process for them to get their Dry Lining NVQ Level 2. This gets the evidence of assessment in the workplace in a different way. People you have worked with and for – who must themselves be in the trade – certify your level of skill on site and this is backed up by undertaking a Professional Discussion and Practical Assessment at the SuperSkills Training Centre. Don’t be fooled, this is NOT an “Easy Option” and we turn down applicants nearly every day, because they don’t have broad enough experience to undertake it successfully. However, if you have got the relevant experience in the trade and you have been doing a full range of work, then this is quicker and certainly cheaper. Take a look at the specific details for the Interior Systems NVQ Level 2 by Practical Assessment here. At SuperSkills we know the vast majority of our customers are looking for qualifications that can be obtained simply, quickly and conveniently. That’s why we are always on the end of the telephone if you want to talk about the best qualification route for you. Call 01845 527 445 to find out more.